FAQ: How to host a EUFAR training course? How to host a EUFAR training course? 1. 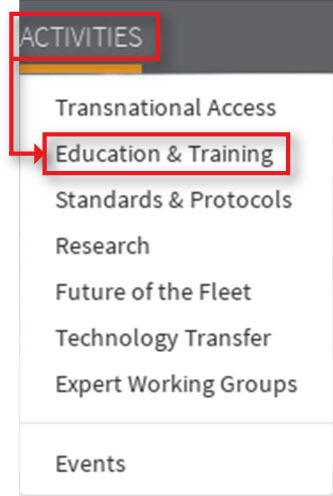 EUFAR accepts Transnational Access Training Course proposals to host a 10 to 12-day EUFAR training course (theory and practice) in airborne research with transnational access flight hours. Proposals are welcomed for the organisation of training courses in hyperspectral imaging applications or in-situ sampling of the atmosphere. EUFAR Transnational Access activity will support a small number of flight hours on the selected aircraft, sufficient to enable the course students to conduct their own scientific data-gathering flights during the course. Therefore, the application to host such an event can only be submitted in response to an open Call for Proposals to host a EUFAR training course. 2. To see if EUFAR is currently accepting proposals to host a training course, have a look at the open calls for proposals on the Transnational Access activity page. On the top main menu, click on Activities, and then in the drop-down menu, click on Transnational Access; alternatively click here. 3. Scroll down to the bottom section of the Education & Training page and click on the tab Submitting TA proposal and click on the icon Calls for Proposals. 4. Once on the TA Calls for Proposals page, to submit your application, click on the Create application icon next to the relevant Call for Proposal to host a training course. 5. Under the field Project type (1), select Training course and proceed to fill all the required fields, marked with an (*). You have the possibility to save your work (2). We advise you to provide as much information as possible by filling in the optional fields, to submit your proposal for pre-review (3) before submission for review (4). Once submitted, the review process will start and your proposal will no longer be editable. To find out more about hosting such a training course, please contact the EUFAR Education & Training Activity Coordinator, Ils Reusen (ils.reusen@vito.be).